In small amounts, stress can be beneficial and even healthy. It’s a mechanism that motivates and activates your body to concentrate and complete the task at hand. The bad news is that too much stress can be devastating. Excessive stress sometimes is hard to notice and has the potential to cause so much damage in our physical and mental health experienced over extended periods of time, that it has been named “The silent killer”. 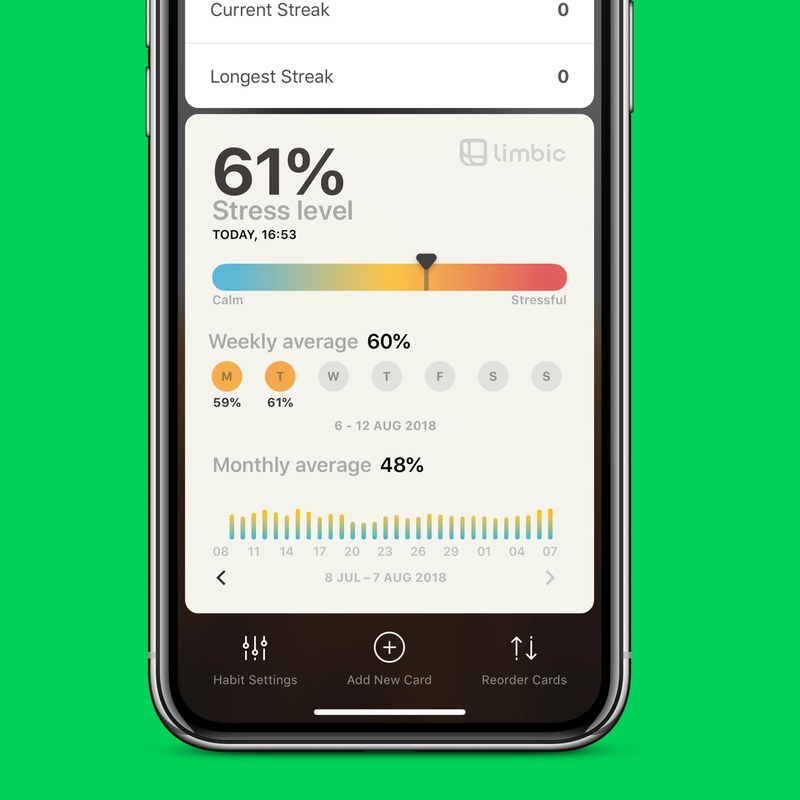 Developed in collaboration with Limbic’s innovative team, we came up with an idea to build a card that would allow you to monitor your stress levels on a daily, weekly and monthly basis. The Stress Levels card uses data gathered from a specific set of Apple Health categories to estimate your stress levels using Artificial Intelligence. The result is a stress level score from zero to one hundred percent. A low score between 10-30 indicates that you are very calm, a score between 40-60 is an indication that you are neither calm but not too stressed either and a stress level above 60 is an indication that you are likely under significant stress. So all you need to do to use the Stress Levels card is wear your Apple Watch and add the card on your dashboard. Today will monitor and estimate your stress level score automatically and update it throughout the day. Don’t be surprised by the values that you will get when you first use the card. Thanks to the use of Artificial Intelligence, Limbic’s algorithm has the ability to learn and improve its accuracy over time. Stress levels estimation is a very complex process so we recommend that you use the card for at least 15 days to get the most reliable result possible. It goes without saying that that the Stress Levels card is not a substitute for any kind of medical and psychological procedure that is meant to help you measure and manage your stress. If you believe that you experience excessive amounts of stress and you’re worried that this may have an effect on your wellbeing, our recommendation is to consult a certified expert. Today's comes with a lot of customization options and an easy way to share your status with anyone you want.